2016 was physically and mentally challenging but not altogether in an active way unfortunately. In September 2015 when I arrived back home in London after finishing the PCT, I was immediately restless and needed to walk. I had limited time so I decided to walk the Camino Frances for a second time. The mistake was thinking my ankle injury from 4 months earlier on the PCT was all healed up… it turned out that it wasn’t and the pain was excruciating on the many hard surfaces of the Camino. Stubbornness and determination got me to Santiago but I knew something was really wrong with my left foot. A trip to the doctor and an MRI confirmed I had torn my ATFL and CFL ligaments as well as cartilage and joint damage. It wasn’t in a good state and probably wasn’t the best idea to walk a further 2,500 miles after that initial roll, (the one with the loud popping sound that ended up with me on the ground and holes in the knees of my pants and the immediate feeling of sickness followed by fear and then tears through clenched teeth). I was told it needed to be operated on immediately because each continued step was only doing more damage, so off I went for a Brostrom Ligament reconstruction. The surgeon cut through my ankle bone, reattached some ligaments, stuck some metal in and sewed it up, leaving me with three sets of stitches and holes around the ankle. My hopes of becoming a foot model (for wide brick-like feet with bunions) were now forever dashed! I’ll skip the part about feeling sorry for myself, frustrated or even being a terrible patient and just say that I wasn’t allowed to walk for 5 months after the operation and there were some moments during that time when I thought that I would never be able to walk again… like really walk, like PCT walk. 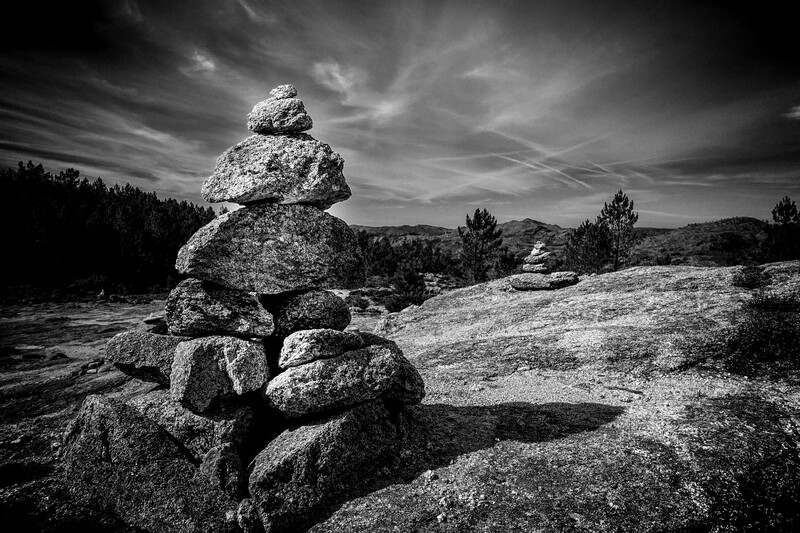 Cairns in Peneda Geres N.P. 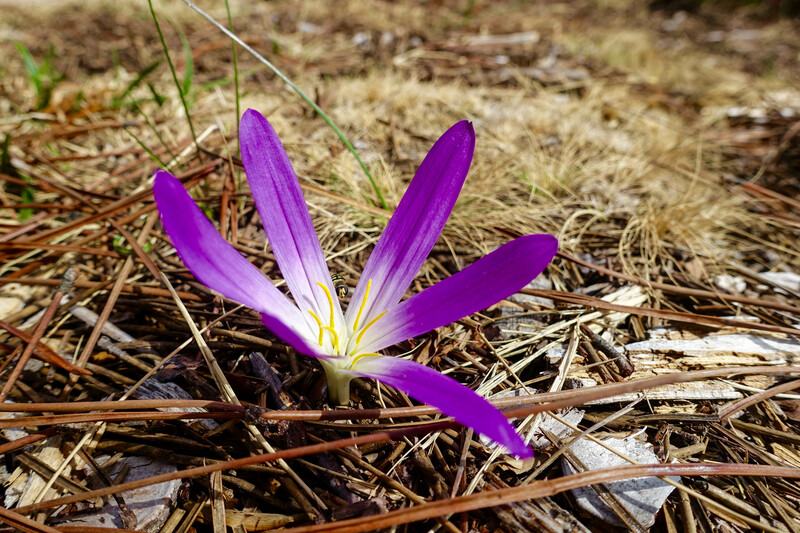 Crocus flower in Peneda Geres N.P. 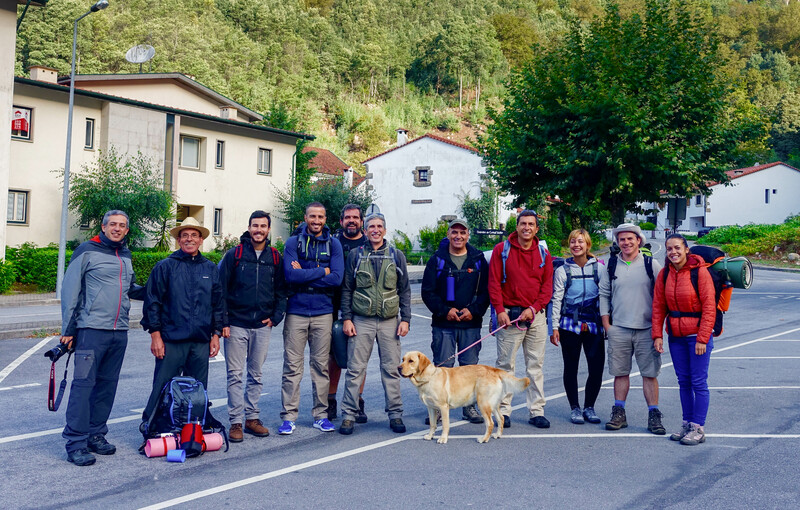 Awesome Hiking buddies in Peneda-Geres N.P. I was also incredibly humbled to be interviewed by the awesome Sarah Williams – founder of the inspiring and motivating Tough Girl Podcast. Most of you will know that I’m scared of my own shadow so it was nice to be considered tough 😉 If you want to listen to me ramble on about walking, click here. So that was my 2016. Since my first Camino in May 2013, I’ve now walked over 10,700km (6,687mi) and hopefully I can continue to walk thousands more. I’m back and I’ve got so much planned for 2017, so stay tuned! 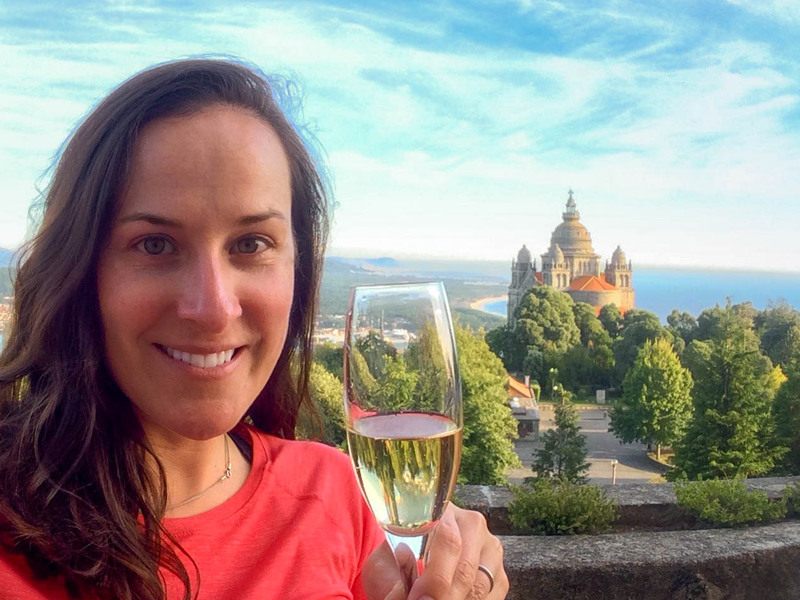 Viana do Castelo… One of the best views in the world! Even better with a glass of Espumante! ← PCTA 2016 Photo Contest… Say what?! Welcome back! I’ve been starved for news of your latest adventures. Stay tough. Glad your back and walking again. Look forward to your adventures. Blessings. Great to hear of your adventures, im glad you ankle has mended and sounds like the surgery was very successful and no permanent damage. You are AMAZING! I agree Portugal is a beautiful country, spent some months there last year also an walked Porto to Santiago also. I thought of you many times since you finished the PCT, wondering what you were up to, so its lovely to hear from you again. Im off to the Camino Frances again on 7 feb actually, intend to go Burgos to Santiago. Im glad that your feet are trotting and that your hand is writing again!! Hi, Kat! It’s good to hear from you. It’s good that you have choosed Portugal to recover from your surgery. Thank you for your words about Portugal. As Portuguese, I’m very happy. I’ll be waiting for more news! The “Pastel de Nata” is the best cake in the world !!!! I was really touched by your words! Bom caminho! Good thing you can walk again! Ultreia, peregrina! Awesome to have you back. You inspire all of us to have no doubt or fear but to keep going. You also remind us that really we should address any injury early. I did an a chillies annoyance in Japan that is still problematic two years later. When I go back to Shikoku next month I will avoid overuse risks and hope I will be fine with some support on achillies and ankle. Great to read your stories and now you are drawing me to Portugal. Perhaps in 2018 I will see you at BOOM FEST near Lisboa at the end of July. Between now and then there are a few thousand kms to enjoy I hope. 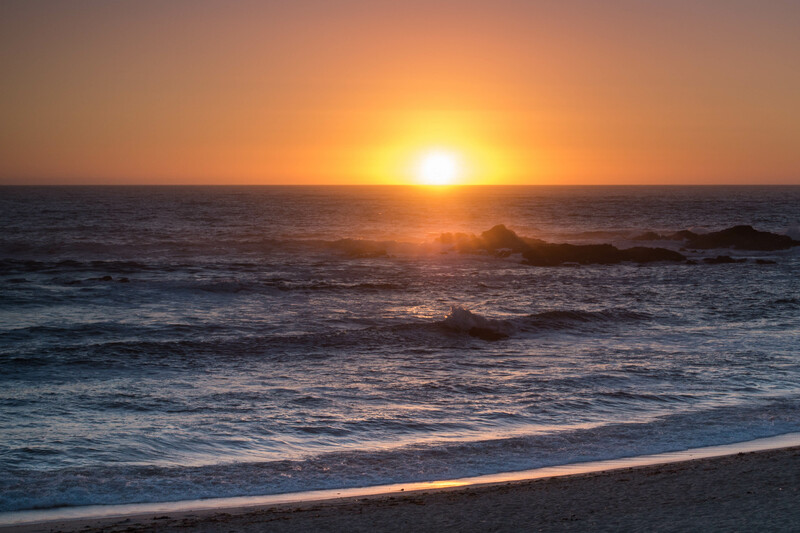 May Peace Prevail On Earth. So glad to hear that you are back on the path again! I have been missing your adventures. I am planning one of my own – the Via Francigena from Great Saint Bernard Pass in August 2018. I can’t help but be excited already! Where’s your next walk leading you to? You must have something planned. Great to have you back and in one piece. Looking forward to hearing what your 2017 adventures will be. Thanks Maggie, where are you off to next? Camino’s Madrid, San Salvador, Primitivo and maybe Fistera, setti off last week in April. Some people say injuries are sent to change our direction in life. No doubt this is endorsed by people who sit all day and with TV. You encouraged me to walk the Portuguese Camino which I completed last year. So different to Frances and Le Puy. However I feel in love with this country and its people. Coimbra and Porto what sensational towns. My wife is a non walker, however we are playing tourists in June and touring Portugal by rail. For quite a small country, Portugal really has a lot to see! My husband is a non walker too but he came to visit a few times last year and we got to explore the Douro upriver from Porto (beautiful! 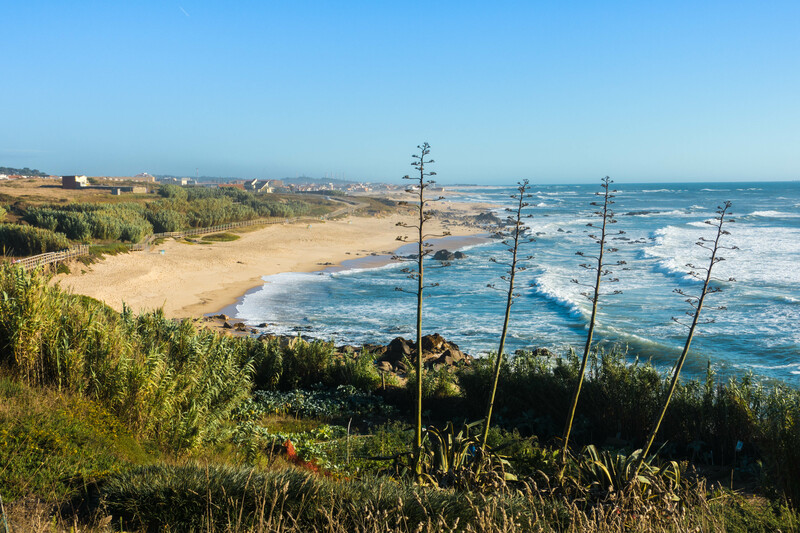 ), Amarante, Sintra & Cascais and Evora further south… I’m sure you and your wife will have a fantastic time! I hope to walk the Norte one day, Buen Camino! Wow, an inspirational post. I had just been wondering what had happened to you as I remembered your ankle problem. So challenging to be dealing with injuries and to not walk for so long when it’s obviously so important to you. I am planning to walk in Portugal this year and haven’t been there before. Can’t decide on the coastal Camino or other Portuguese Camino. Best wishes for your continued healing. Jennifer. So good to hear from you‼ Wishing you well. Well done Kat… Trust that ankle holds up and looking forward to hearing more from you in 2017! Thanks! What adventures are you guys up to this year? Ola! Great to hear you’re back and on the road again! Looking forward to hear more aboutnyour recent Portuguese journey!